1. Show the relation and difference among DWANI, NAAD and SHRUTI with their introduction. 2. Why is THAT not sung? What is THAT? What are the types of 'THAT' in classical music? What is its relation with 'RAAG'? 3. According to the classical music, how many JAATIES are there in Music? Write its importance. 4. How are RAAGS are constructed and classified in classical music? Write with examples. 5. Can classical music be considered as a base of modern Music? Explain, with points about the origin of Music. 6. Give introdictin of RAAG 'JOINPURI'. Write down the Notes, singing time of Raag and PAKAD used in this Raag. 7. What are the notations which are used in singing or playing instrument? Why notation is used? Write any six notation sign. 8. Write the importance of TABLA and MADAL in music? Explain along with example. 9. Discuss about good singing. Does classical singing have any positivity? Write your own feelings. 10. What are the similarities and differences between the songs created in room and established RAAG? Clarify with examples. 11. What sentiments are expressed in classwise song of class X and National Anthem? Explain. 12. 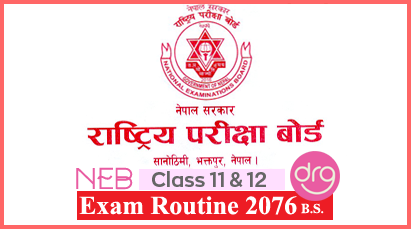 Explain about the similarities between staff notation and Bhatkhand notation with suitable examples. 13. Write about any instrument or folk singing you like. 14. Group of notes used to pracitce classical song is called ...... .
16. God's name is included in this singing so it is called. 17. .............. is an example of rhythm instrument which is used in classical and modern singing. 18. The sign used in bar line and space line is called ........ .
19. .................. notes are used Raag YAMAN. 20. The song sung in rainy season is called ............ song. 22. There are ............. matras in Kaharwa Taal. 23. Raag sung from 4 am to 7 am in the morning and 4 pm to 7 pm in the evening is called ......... Raag. 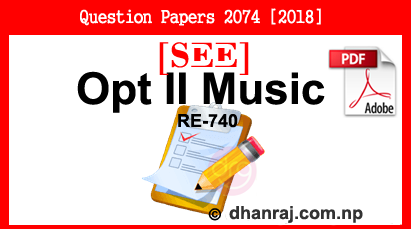 0 Response to "Optional II Music | Exam Paper | 2074  | RE-740 | SEE"